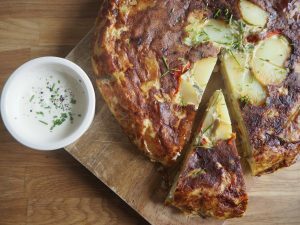 My twist on a traditional Spanish tortilla omelette involves adding sweet red pepper, a mix of red and white onions and chives. 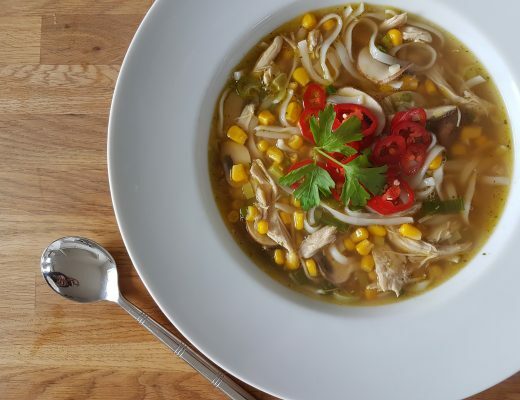 Then served alongside a lemony aioli sauce, this makes for a delicious gluten free dinner. 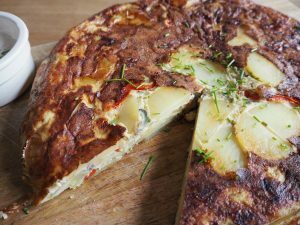 The tortilla can be served hot or cold and is a great one to make in advance. 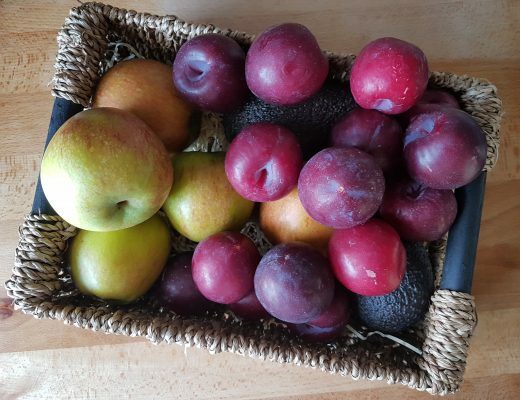 We often have ours warm for dinner, with a big salad and some gluten free bread, then portion up to have cold for lunches later in the week. 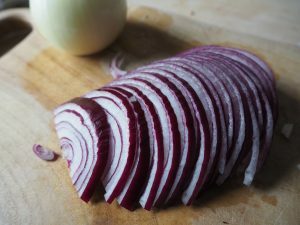 Peel and halve the onions, then slice them finely. Pop them into a large high-sided frying pan, along with the olive oil It might seem like a lot of oil, but trust me it is needed for this recipe. 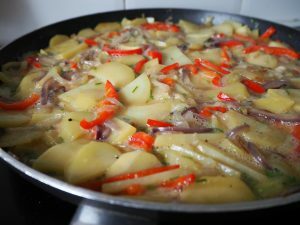 The traditional Spanish recipe uses a lot more! 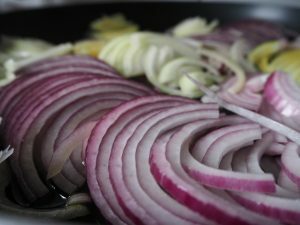 Cook the onions on a medium-high heat for 10 minutes, stirring regularly. After this time they should be starting to soften. 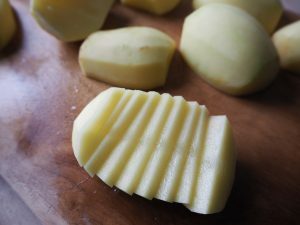 Peel the potatoes, halve any large ones and then chop into thin slices – thicker than the onion, think pound-coin thickness. If you cut them much thinner they will smoosh when you are cooking them and if you leave them too thick they will take longer to cook. 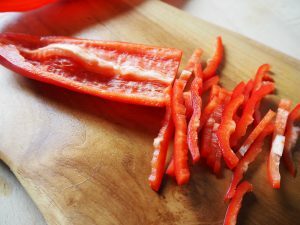 Halve and deseed the pepper and slice into thin strips. 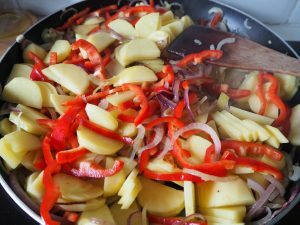 Add the potato and pepper to the pan with the salt and a good grinding of black pepper, then cook over a medium heat for 10 minutes. After this time, take the pan off the heat and set aside while you prepare the eggs. Crack the eggs into a large bowl and whisk well for a couple of minutes. 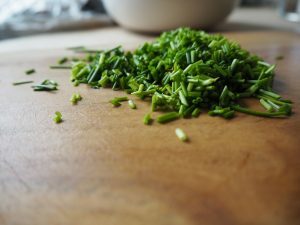 Finely chop the chives and add them to the beaten eggs. 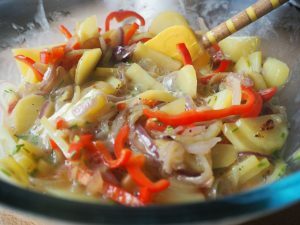 Next, tip the contents of the pan (potatoes, peppers and onions) into the bowl with the eggs. Give everything a good stir to combine the ingredients and to give the vegetables a coating of egg. Once done, carefully pour the mixture back into the frying pan. 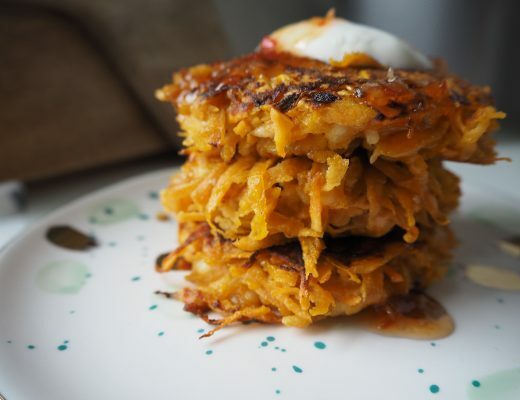 Use a spatula to press the ingredients down to give your tortilla nice layers. You should also ensure the onion is evenly distributed throughout the tortilla (as it has a tendency to clump together). Now turn the heat back on, set to low. The tortilla now needs to slow cook for 45 minutes – 1 hour, until the potatoes are nice and soft and the tortilla is pretty much set on top. Tend to the pan during cooking, especially if you have an immersion hob rather than gas. You will need to move the pan around every now and them to ensure even cooking on the underside. Keep the heat nice and low to avoid overbrowning or burning the tortilla. So while that’s cooking, you can whip up my easy lemon aioli. 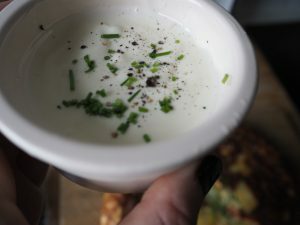 Simply mix the lemon juice, mayonnaise and finely minced garlic clove together in a ramekin and voila! Top with black pepper or a few chive pieces then pop in the fridge to chill for the remaining cooking time. Back to the tortilla. When the cooking time is up, carefully place a large plate over the top of the pan – it needs to completely cover the tortilla. Quickly flip the plate and pan over 180 degrees and the tortilla should now be on the plate. Slide it back into the pan, so that the side that was previously facing up is now facing down. Allow to cook for 10 minutes to soften any potatoes on that layer and to allow the bottom to fully set. Now you tortilla is done! Serve with the chilled aioli and a sprinkle of chives on top. We like to eat ours with a fresh tomato salad and gluten free bread.